If you obsess about food and find yourself emotional eating and binging and then feeling guilty, you aren’t to blame. 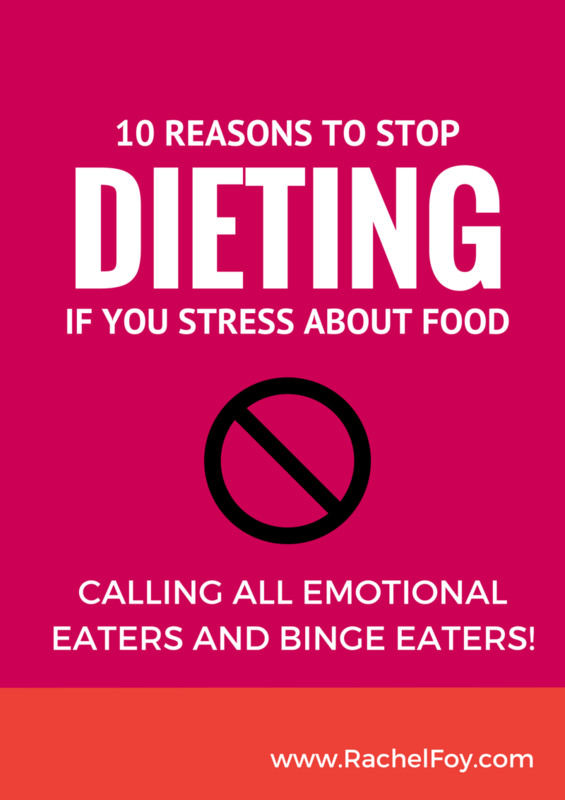 Here are my top 10 reasons why diets are in fact to blamed why you must stop dieting…. 2. Diets encourage you to obsess about food (especially the ‘bad’ food!) Stop dieting! Deprivation causes us to feel left out, we aren’t a part of things anymore (saying ‘no’ to the birthday cake in the office, saying ‘no’ to the popcorn in the cinema, saying ‘no’ to the glass of wine with dinner) Restriction is the same, no human being on this planet wants to feel restricted in whatever way that might be for them. Sometimes life brings us restriction which is forced upon us, (can’t move house due to money, stuck in a job due to circumstance) but some things are easier to change and control than others. What you choose to put in your mouth IS in your control and you can change that feeling of restriction by changing what you et. It really is that simple. A normal women (who has cellulite, a ‘mummy tummy’ and a wobbly bottom!) who exercises regularly, drinks lots of water, has a job which she adores and a husband who thinks the world of her, she socialises several times a week with friends and finds herself feeling very blessed and grateful for her life. Who is the healthiest?? Who is the happiest?? Who is in balance?? If anything isn’t sustainable and actually causes stress and difficulty, you will not stick to it. We all want life to be easy and we all have a right to have things as easy as possible. Eating shouldn’t be any different. If food and eating causes you stress right now then something isn’t right. I am a huge advocator that women need to stop waiting on their weight to create and have an amazing life so that of course includes dieting. If you are waiting until your skinny jeans fit you again and the diet works (you’ll be waiting a while by the way lovely lady as statistically diets only work for 0.1% of the population in the long term) until you start saying YES to the coffee mornings, dinner dates and birthday lunches, you’ll find yourself in a vicious cycle of dieting, falling off, binging, feeling guilty and starting a diet again. I did that for well over 10 years. Food is emotional. We all have emotions and often memories and stories connected to food. Take away the food (through dieting) and what do you have?? An emotional void that is looking for a way to be filled. Now don’t get me wrong, this is slightly different to someone who is always emotionally eating as a way of pushing all the emotion inside her down and choosing to numb out. I’m referring to those moments when our desires for something pleasurable in the form of food, overrides our physical hunger and we desire something to eat. Diets don’t allow for this. They make us feel guilty for giving in. They make us feel shame for not ‘sticking’ to the rules. I’ve learnt from experience by the way that when you embrace the fact that we all turn to food at some point for emotional support (emotional eating can perhaps never be completely ‘cured’) it gives you consent to eat in a different way. You eat without guilt. You eat with permission. You eat through choice. You eat feeling empowered. You also bizarrely often don’t eat too because that’s OK as well! I sometimes have popcorn at the cinema and sometimes not. When I was food-obsessed I always had the largest popcorn at the cinema and ate it all. I would partly be enjoying the delicious warm and sweet taste but would also be terribly aware of the guilt bubbling up inside. Each mouthful wasn’t just popcorn, I was eating the guilt too. I teach my clients about intuition as it’s something which, particularly as women, we have a huge gift with. When we listen to ourselves or our bodies or our gut, we are in connection with the most valuable thing which we have, ourselves. Diets teach us to not trust ourselves especially around food and without self-trust, you are heading towards a really dysfunctional relationship with food. Diet says: Drink water instead of eating as you probably aren’t hungry Your intuition says: No I am really hungry, I need food!! Intuition says: Its 6.30pm and I’m starving, feed me, I’m hungry! This is particularly close to my heart and I can remember in vivid detail the feeling of failure and guilt whenever I fell off the diet wagon (and I fell off them all by the way at some point). Part of me would feel so worthless that I had once again broken my diet even though another part of me was delighted that I was tucking into some chocolate on the sofa watching tv with my then-boyfriend. Over the years, as each diet attempt came and went, I truly started to believe it was me not being good enough, strong enough, able enough. It did nothing for my self worth and self esteem which where already at an all time low hence the reason for my need to control my food and my weight, I believed being a size 10 would be the answer and suddenly I would feel freakin’ amazing. Guess what though that never happened. Why? As each diet I embarked on helped to reinforce the opinions I had about myself when I couldn’t stick to the rules. 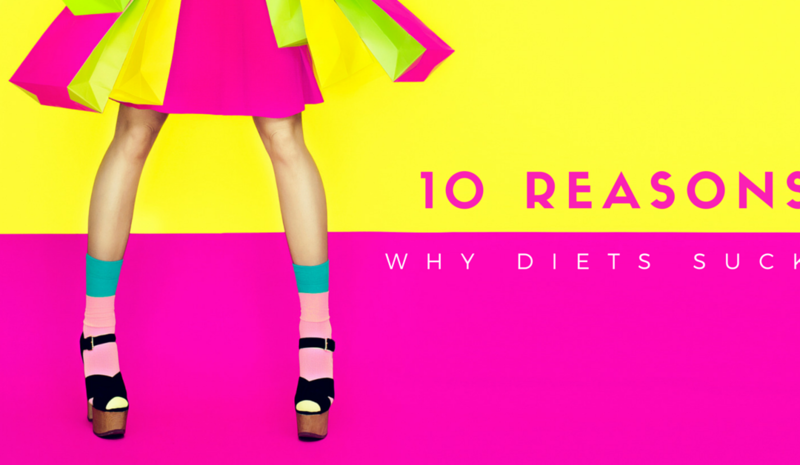 So there you go my lovely, my 10 reasons why you need to stop dieting if you are obsessed about your weight and food. If you truly want to find freedom with food, stop all those obsessive thoughts about food, weight and eating in your head and actually start enjoying life to it’s fullest potential then I hope you take on board (and put into action!) the reasons above. If you want to surround yourself with AMAZING women who are deliberately and intentionally breaking their diets rules whilst finding their freedom with food in the process, get yourself over to my private facebook community!